No dues or membership fees - open to any licensed radio amateur or shortwave listener (SWL) worldwide with at least some interest in CW/QRP operation. Encouraging the use of CW and helping all hams increase CW speed and proficiency is a top club priority. Club activities are dedicated to QRP/QRPp operation, using CW and emphasize using simple wire antennas. Do you need to update your personal membership information? Go to our MEMBER UPDATES page. Amateur radio has something for everyone. SSB, FM, AM, the digital modes, and QRO power levels all have their place in this great hobby and we certainly recognize the importance of these modes as well as the enjoyment that they give to many. But for a growing number of hams the challenge of "doing the most with the least" makes QRP (and QRPp) CW operating the greatest thrill available in amateur radio, and the North American QRP CW Club exists to promote this exciting facet of the hobby. As part of our focus we also encourage, but do not limit operators to, the use of simple wire antennas. 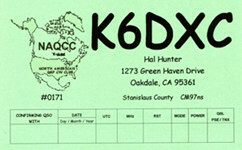 The NAQCC provides numerous opportunities for hams to enjoy QRP/CW operating. For contester types we have a popular monthly 2-hour sprint that runs at relatively low CW speeds and at a fairly relaxed pace. Three special sprints also take place during the year for 160-meter and QRPp operators. For a month-long activity we offer our members a Monthly Challenge that can be anything from forming a list of words from the calls of stations worked, to making a prescribed number of contacts using home-brew gear. There is also an extensive awards program to recognize the significant QRP/CW accomplishments of our members. We also serve as a resource for people who are just getting started in QRP and/or CW. Our slow-speed CW nets are a great place for beginners to practice Morse code under real on-air conditions. Beginners will also find a wealth of helpful information on our club website and we are more than willing to try to answer any questions about QRP and CW that you might have. An extensive monthly newsletter is filled with useful projects and news from fellow QRPers. A number of local NAQCC Chapters offer opportunities to get together for in person socializing and QRP/CW activities. Portable operations are especially popular with the local chapters. Whether you are a veteran ham radio operator who is looking for a new challenge in the hobby, or a beginner who is intrigued by the possibilities of QRP/CW communication, we cordially invite you to join us. Membership is free and the benefits and fun are significant. The club depends on donations from our members to take care of our financial needs. If you would like to help out with a donation there are two ways that you can do it. The first way is to use PayPal to electronically send your contribution to VP John Smithson, N8ZYA, using the email address "jspiker58 AT gmail DOT com" (squeeze that together and change two words to symbols). To avoid any additional fees be sure to check the box that says "I'm sending money to family or friends." Also please add a note indicating that this is an NAQCC donation. 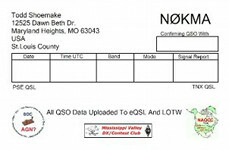 The second way to make a contribution is to mail a check or money order made out to the "North American QRP CW Club." Send your check to John Smithson, 1529 Virginia St E, Charleston, WV 25311. Assuming that we have your correct email address on file your contribution will be acknowledged by email with a carbon copy sent to a second club officer as a "check and balance." We also sometimes accept non-monetary donations of ham radio related items that are then used as prizes for various drawings and activities. Please contact us ahead of time to discuss the specific item that you are considering donating. We thank all of our members who have made the generous donations to help keep the NAQCC alive and well! Show your pride in being a NAQCC member with one or more of these items. Click the item for details. For your web site, email signature, QRZ listing, etc. - NAQCC logo and/or banner.